No matter what your destination, Livguard automotive batteries are all about the delivering the perfect road experience. They are designed for the extra performance of your vehicle in challenging road situations and all types of weather conditions. 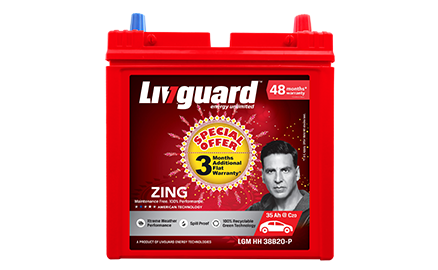 Livguard Zing LGM HH 38B20 BH L automotive battery is designed for the superior performance of your car, in every road and weather condition. Equipped with American technology, Zing battery is designed to meet the performance, reliability and stringent safety demands of new generation of cars. 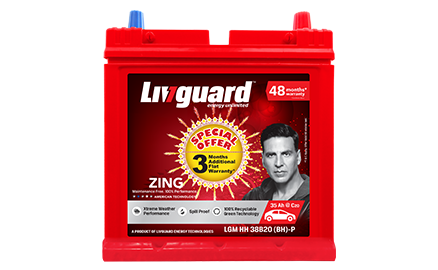 Livguard Zing LGM HH 38B20-P L automotive battery is designed for the superior performance of your car, in every road and weather condition. Equipped with American technology, Zing battery is designed to meet the performance, reliability and stringent safety demands of new generation of cars. 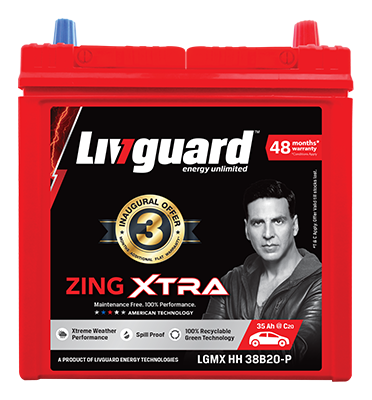 Livguard Zing LGM HH 38B20-P R automotive battery is designed for the superior performance of your car, in every road and weather condition. Equipped with American technology, Zing battery is designed to meet the performance, reliability and stringent safety demands of new generation of cars. 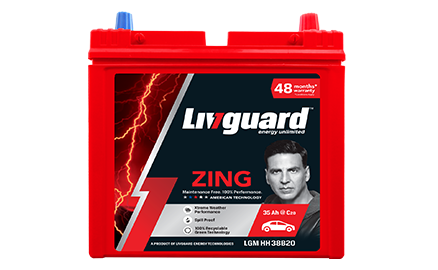 Livguard Zing LGM HH 55B24LS automotive battery is designed for the superior performance of your car, in every road and weather condition. Equipped with American technology, Zing battery is designed to meet the performance, reliability and stringent safety demands of new generation of cars. 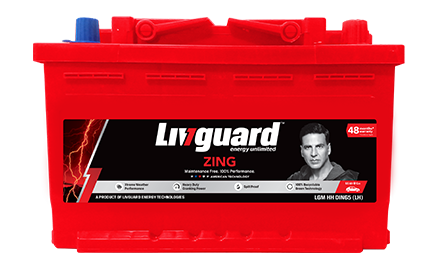 Livguard Zing LGM HH 75D23BH L automotive battery is designed for the superior performance of your car, in every road and weather condition. Equipped with American technology, Zing battery is designed to meet the performance, reliability and stringent safety demands of new generation of cars. Livguard Zing LGM HH DIN44 LH automotive battery is designed for the superior performance of your car, in every road and weather condition. Equipped with American technology, Zing battery is designed to meet the performance, reliability and stringent safety demands of new generation of cars. Livguard Zing LGM HH DIN50 automotive battery is designed for the superior performance of your car, in every road and weather condition. Equipped with American technology, Zing battery is designed to meet the performance, reliability and stringent safety demands of new generation of cars. 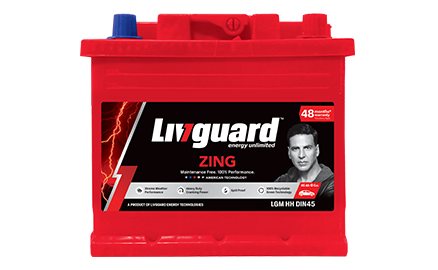 Livguard Zing LGM HH DIN55 R automotive battery is designed for the superior performance of your car, in every road and weather condition. Equipped with American technology, Zing battery is designed to meet the performance, reliability and stringent safety demands of new generation of cars. 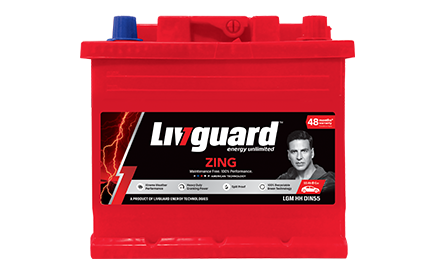 Livguard Zing LGM HH DIN60 automotive battery is designed for the superior performance of your car, in every road and weather condition. Equipped with American technology, Zing battery is designed to meet the performance, reliability and stringent safety demands of new generation of cars. Livguard Zing LGM HH DIN65 LH automotive battery is designed for the superior performance of your car, in every road and weather condition. Equipped with American technology, Zing battery is designed to meet the performance, reliability and stringent safety demands of new generation of cars. A perfect blend of the grid structure and plate chemistry ensures higher cranking power. Designed to reduce water loss and increase efficiency. Robust Grid Structure and Double Clad Separation offers long life to our batteries. Find the best fit for your vehicle. Find your nearest Livguard dealer. Register your Livguard Product online for complete peace of mind anytime, anywhere! Contact us for inquiries about product purchase and order, or feedback and complaints. Do you have any queries or comments about our website, our products or any of our services?